Q. You do both styling and interior design. How do those two inform each other? A. Staging is implementing design ideas in a practical and tactile sense. The types of projects I do are so different. For example, my interior design clients either know me or find me on the Internet, but staging clients are often repeats. I used to think interior design and styling were similar, but the process is very different for the two. Staging is quick and showcases the home, and interior decorating is to live in. I have one client who started with me over a year ago and we’re still not done. It takes time to make the decisions, but with staging you have to work quickly. The sharp geometry of a square pergola centers the Japanese-inspired landscape. The bold orange hue of the Malm fireplace is repeated in the chairs and pillow cushions as a shock of color. Q. How is styling for mid century design different from other types of homes? A. With staging, you do need to appeal to a larger audience, but I love to find pieces and accessories that fit mid century style. I rent some of my big pieces, and then I go purchase some of the accessories. I get some of my accessories from thrift stores. For mid century, it’s usually a resale shop. It takes some time to go searching for the pieces, and true mid century furniture is not cheap. I may keep the pieces afterward, or I may donate them. I want every place I style to look different, and I do a broad range of décor styles. But there’s definitely a strong leaning toward MCM in Seattle. Playing with contrasts, several spaces throughout the home pair very dark and very light neutrals in foundational design elements, letting color present itself in plant life. Q. 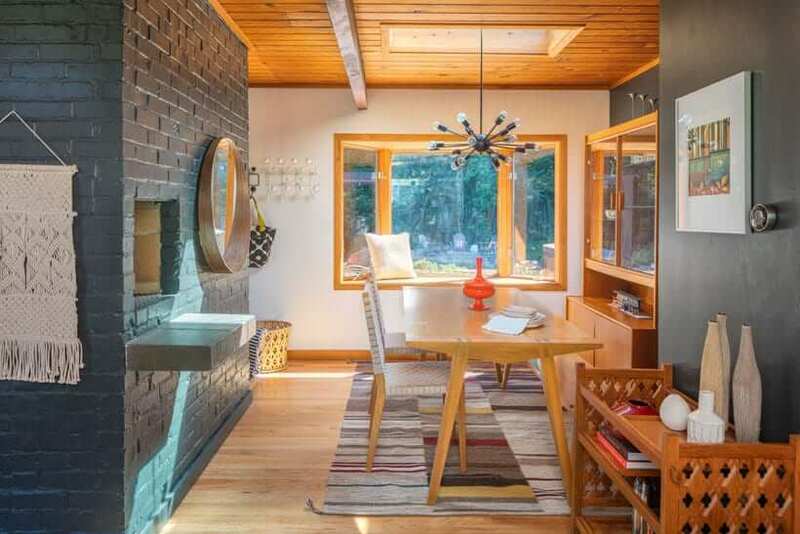 Do you see a lot of mid century style in the Seattle housing market? A. 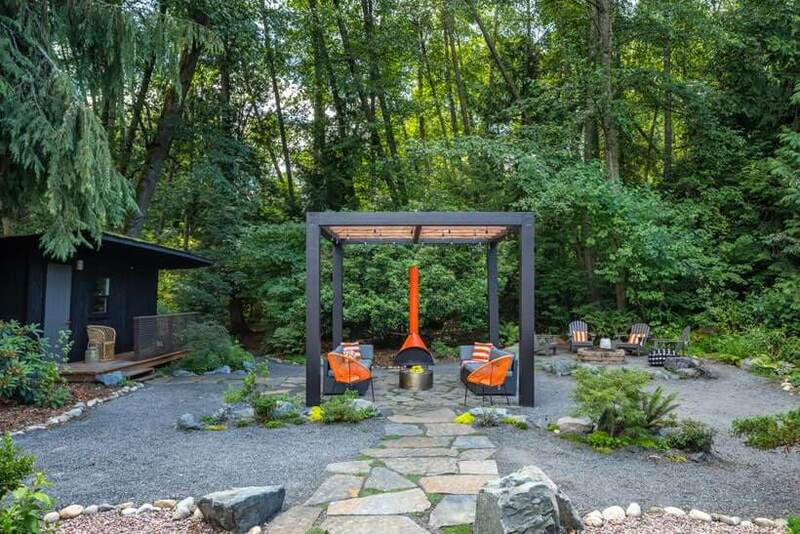 Especially in Seattle, mid century is very popular. It has a younger demographic, people in their 30s really love it. 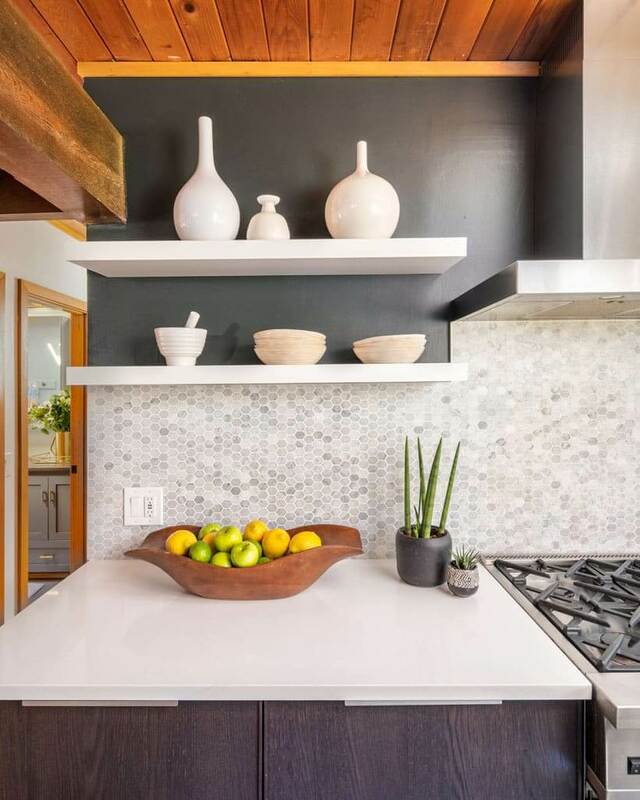 If the home is mid century, clients want that style for interiors. Q. What drew you to mid century style personally? A. I partly grew up with that style because I’m a child of the ‘70s, but I didn’t really realized the style was still so popular. Now I’m wishing I kept my grandma’s furniture, because they were true mid century. I keep my eye out for certain pieces whenever I’m shopping for furniture. I’ve embraced the style a lot more because of my work with Atomic Ranch. The dining area contains subtle mid century nods, like the table and chairs featuring sleek lines and light woods. A vintage teak Danish hutch was discovered at a thrift store and fittingly houses upcycled finds. Q. What advice would you give homeowners who want to style their own homes for pictures or a party? A. Ensure that your personality always comes through. One mid century house is going to look very different from another. What I love about working with Atomic Ranch is that the homeowner’s personalities come through. Anything I’m styling, even if it’s for someone else, I want my own flavor to show through. For a party, I want the styling geared toward the guests, so I ask myself: What’s going to make other people feel invited? I do that throughout any of my staging. What will make other people feel comfortable? Do we have conversation pieces sitting out? 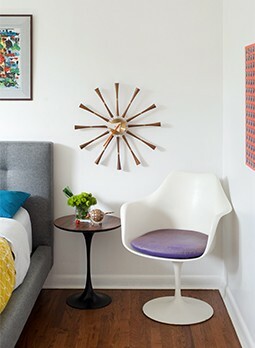 That’s what’s cool about mid century style, there are always cool conversation pieces. For more, visit Michelle Faith Design’s website!